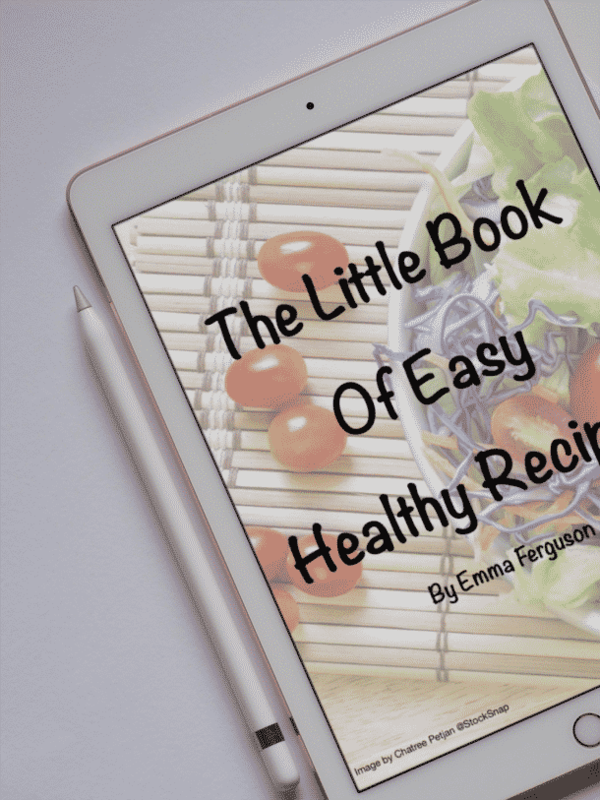 Occasionally I will share a recipe from another blog or from one of my many (and I mean many), cookbooks. Always giving credit where credit is due. 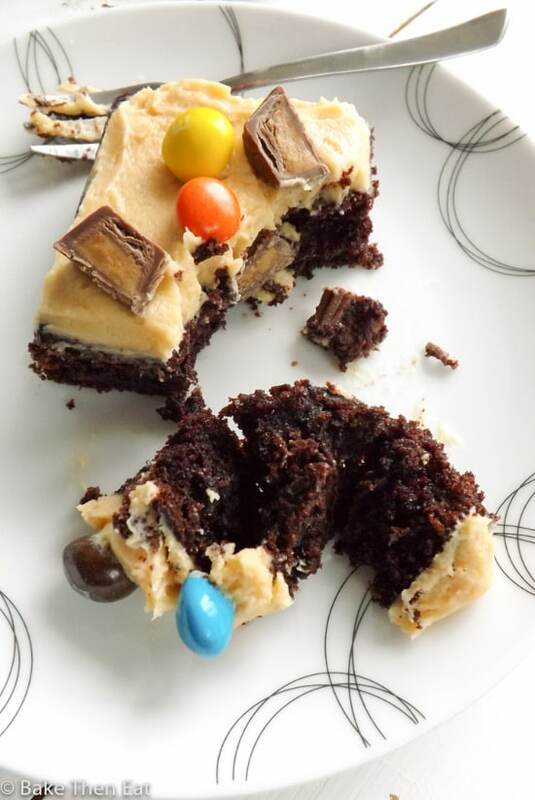 This recipe for, Insane Chocolate and Peanut Butter Sheet Cake came about in a fit of desperation of sorts. I had suffered 3 kitchen fails in a row and 2 rather dubious attempts at other “home” created recipes. I had convinced myself I had forgotten how to bake! Honestly, it would have been less stressful just throwing the money straight into the bin and bypassing the oven. With blog deadlines looming I needed to get myself together. Not trusting myself to create a recipe I needed something with the ultimate comfort food included chocolate and peanut butter I set about scouring the internet. I had recently bought a new cake pan so I could make a sheet cake. (I have been watching far too much Ina Garten on Food Network). I actually struggled to find one but I did come across this recipe and I though what the heck I’ll give it a go. I mention this in the baking instructions also, the original recipe states 30 to 35 minutes for baking. Picture me, nervous, convinced I could no longer bake checking my cake at 35 minutes (I have a slow oven) and its still almost raw batter. Panic stricken I ran back to the internet page and saw that the directions I was reading was for two 9 inch round pans. Doh! I left the cake for another 20 minutes and it baked perfectly. Because I wanted peanut butter to make myself feel a little better. 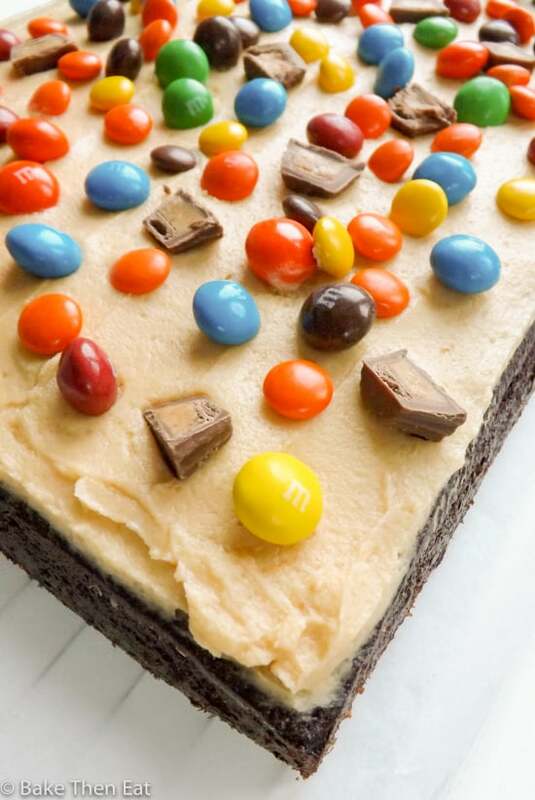 I frosted this cake with a cream cheese peanut butter frosting and threw a ton of peanut butter candy at it. I know we all have baking disasters and in hindsight, they are funny. But at the time its like the world has ended! Have you had days like that? 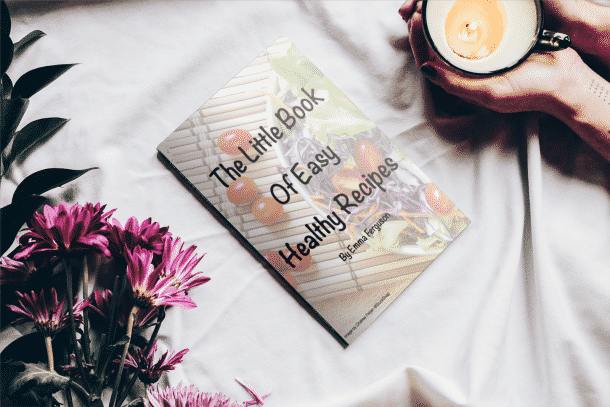 Original recipe from Sherry over at My Best Cookbook. If you live in the UK and have issues with cream cheese frosting check out this post where I explain how to beat the gloopy mess that can happen with this type of frosting. 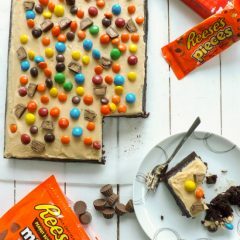 A classic rich chocolate sheet cake topped with peanut butter cream cheese frosting with an insane amount of peanut butter candy thrown at it! Preheat your oven to 180C / 350F / Gas mark 4 and lightly grease a 9 x 13 inch tin that is at least 2 inches deep. Then place to one side. In a large mixing bowl add in the sugar, flour, cocoa powder, baking powder, baking soda and salt. Give it a little whisk to mix everything together. Switch the kettle on to boil and while it is heating carry on with the cake. 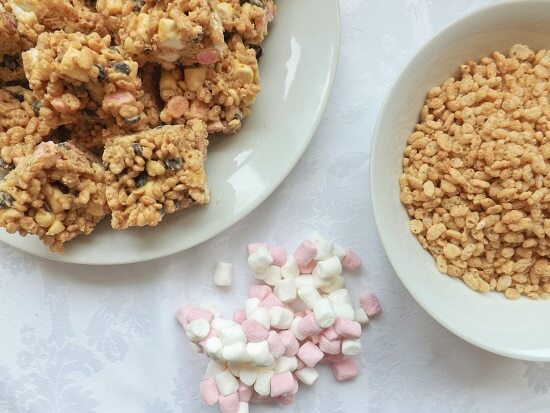 Add in the eggs, milk, vegetable oil and vanilla extract and give everything a good mix. The batter will be thick but this is fine the boiling water will thin it right down. Pour in the boiling water and mix it in as quickly and safely as you can. The batter will be very thin but this is what you want. Pour it immediately into your prepared baking pan and pop it in the centre of your hot oven. The original recipe states this cake bakes in 30 to 35 minutes. I checked it at this point and it was no where near done. In my oven this cake took between 50 to 60 minutes. By all means check your cake at 30 minutes, and keep going back to every 5 to 10 minutes to check for readiness. Once a skewer comes out clean from the centre this cake is done. Like I said in my oven it to somewhere between 50 to 60 minutes. Once baked take the cake out of the oven and allow the cake to fully cool down in its tin. At least 1 hour. Once the cake is fully cool, turn the pan upside down onto a wire rack and the cake should just fall onto the rack. Turn it back over and your cake is ready to frost. Beat your butter with an electric mixer or a stand mixer until it is pale and fluffy. Add in the peanut butter and again mix for a couple of minutes until it is smooth and creamy. Slowly add in the icing sugar with the beater on low (so as not to create a dust cloud!) Beat until everything is well mixed together. Add in the cream cheese and mix for a minute or two until it is well combined. If you are in the UK please check above for a link on working with cream cheese if you live in the UK! 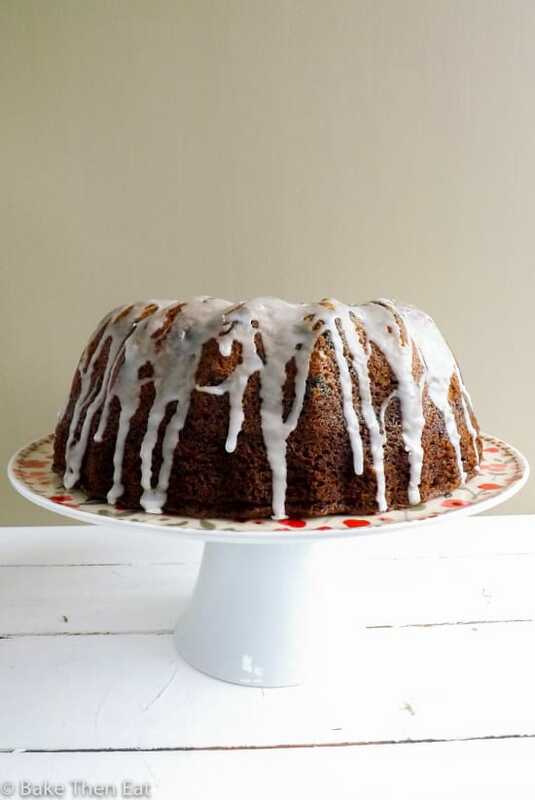 It will stop your frosting from going all runny and gloopy! 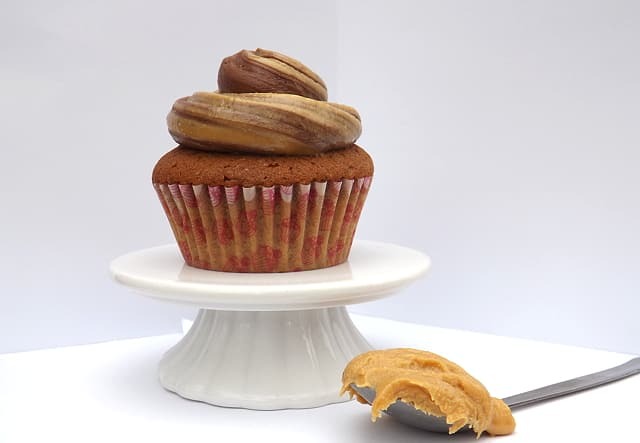 Take 20 of your mini peanut butter cups and gently press them into the top of the cake at regular initials. The idea is when the cake is cut each piece will have one in the middle. I found I got 5 across and 4 down, giving me 20 equal squares for serving. First off you will need to do a crumb layer. Take about a 3rd of your frosting and gently spread it across your cake, don't worry if it looks full of crumbs we will cover this all up. Once that is done pop the cake in the fridge for 10 to 15 minutes to firm up that layer. Once that is done the crumb layer will act as a barrier and you will be able to frost your cake normally. Spread the rest of the frosting evenly across your cake. Take your remaining 10 mini peanut butter cups and cut them in half. 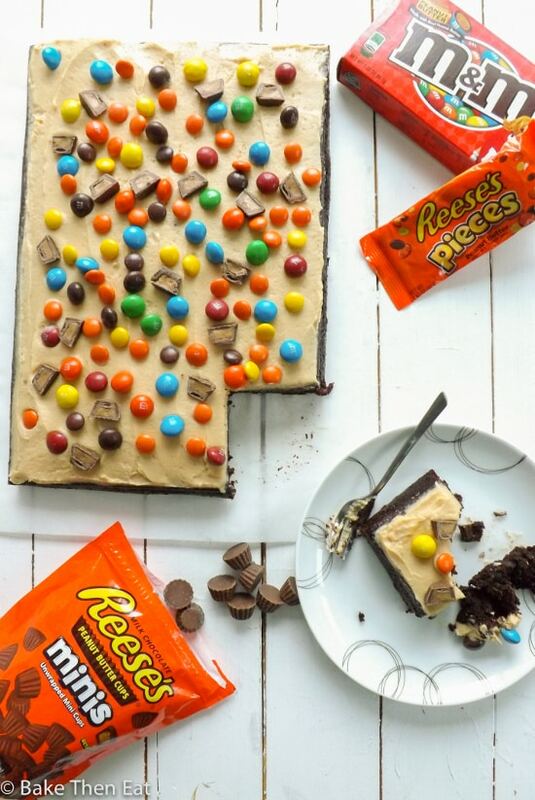 Take them, your peanut butter m&m's and Reese's Pieces and scatter them all across the top of your cake. Because of the frosting this cake will need to be kept in the fridge, also it cuts better when cold. But bring it back up to room temperature before serving. Kept in the fridge in an airtight container this cake keeps well up to 5 days. Had to stop reading half way through because I got so hungry. Sheet cakes are something I haven’t seen before (am I out of touch?) but I love the look of this! Hi Emma, nah you’re not out of touch its very much an American style cake. You only really see them in Costco over here in the UK. Aaw, kitchen fails are no fun 🙁 This cake is the perfect reward after all of that. It looks phenomenal! Love chocolate and peanut butter! You definitely redeemed yourself with this spectacular cake! This would definitely be a hit at my house! 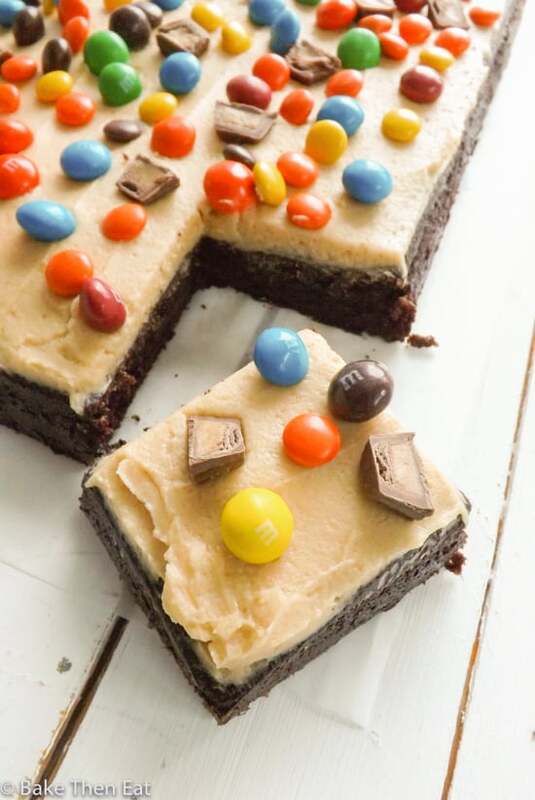 Gah – peanut butter and chocolate is a match made in heaven!! This cake looks soooo good! Ugh recipe fails – they are the worst. Looks great! Peanut butter and chocolate are my favorites, so this is right up my ally! I to have been having baking failure after baking failure-it’s driving me crazy! Glad I’m not the only one! Trust me Heather you are not alone, I think we all have baking disasters 😀 Its just so frustrating when you need to bake as much as we do when we have blogs and we hit a bad streak!Thanks for stopping by. I hate baking failures when you are trying to document them for the blog. They can be so frustrating! I think this came out great and the photos look yummy! My 3-year old daughter would go bonkers over this! This cake is just amazing! loving all the candy topping especially.. wish I had a slice right now! I’ve definitely had days like that – I think we all have! It’s always nice when it ends in cake though. 🙂 I’m loving all that peanut buttery candy on top! I’m pretty sure I could devour this whole cake in minutes! There’s only one word to describe this insane cake and that’s fun. Hi Maureen, thank you 😀 it certainly is a fun cake!